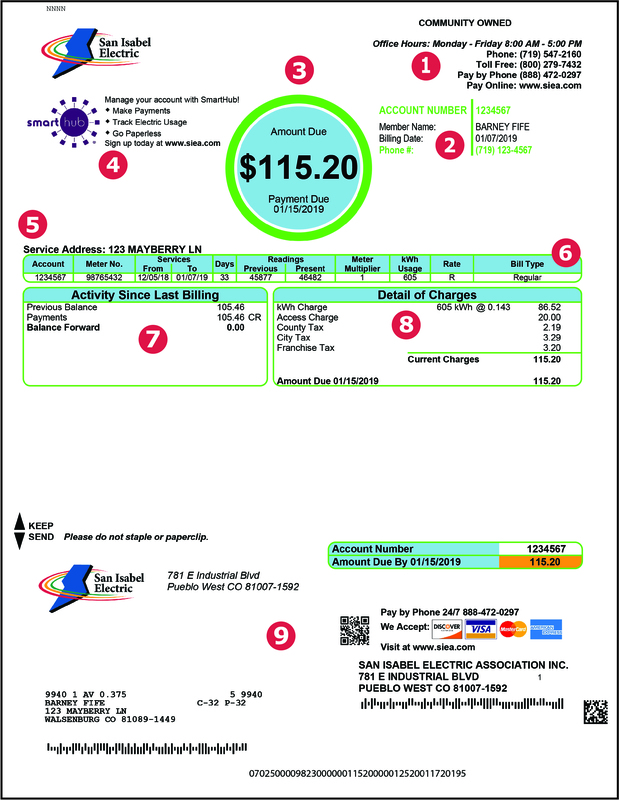 Your San Isabel Electric bill will soon have a new and improved look. 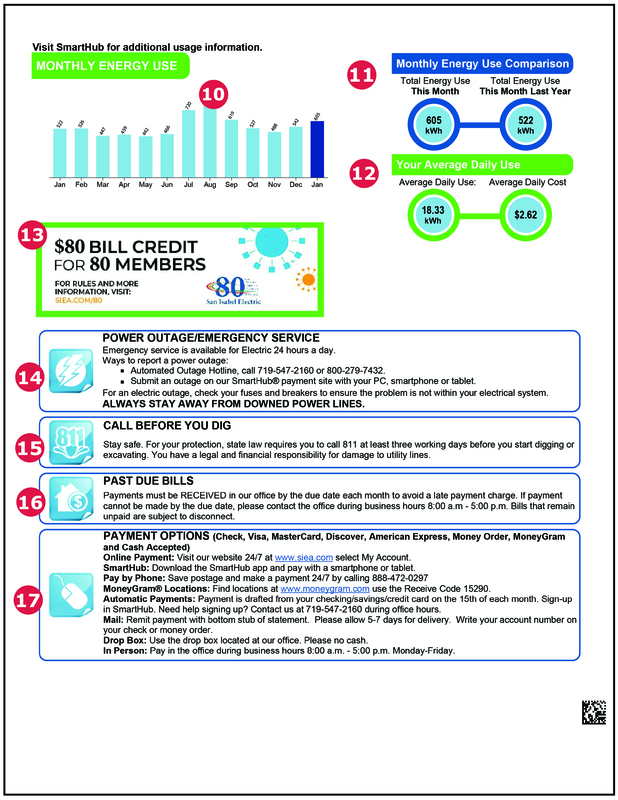 Beginning in February, your bill will have a simplified layout that makes it easier to understand. It will also provide energy usage charts that will give members more visual information to compare your usage from month to month and see your average daily consumption. Overall, it will be easier to locate, read, and understand the information presented on you bill. SIEA Information – Our office hours, main phone number, and pay online web address. Your Account Information – Your account number, member name, billing date, and phone number. Total Amount Due and Due Date – Summarizes the total amount due and the due date for the service address listed. SmartHub – Information about our online bill pay service, SmartHub. Service Address – The address of service. Metering Details – Includes account number, dates of service, number of days in the billing cycle, and previous and present meter readings. The meter multiplier converts energy to the correct kilowatt hour reading. KWh usage is how much energy is used, while the rate type is based on the account type and energy consumption. Activity Since Last Billing – Your previous balance, payments made, and the balance that was carried forward. Detail of Account Charges – KWh used and the rate charged. The access charge pays for infrastructure, maintenance, and expenses for access to the power grid. This section also includes any applicable taxes for your account. Payment Stub – For use when mailing payments. Monthly Energy Use – Detailed bar graph of your monthly energy usage for the last year. Monthly Energy Use Comparison – A side-by-side comparison of your energy use this month compared to the same month last year. Your Average Daily Use – Average daily kWh usage along with the average daily cost of electricity. Important Messages – Read important messages about products, services, promotional offers, and events. Power Outage and Emergency Services – How to report and outage and where to call in case of an emergency. Call Before You Dig – Reminder to call 811 at least 3 working days before you dig or excavate. Past Due Bills – Information about late payment policies. Payment Options – Along with mailing your payment, San Isabel Electric offers several convenient ways to pay your bill, including SmartHub, online payments, pay by phone, MoneyGram, autopay, dropbox, and in person. We accept cash, check, Visa, MasterCard, Discover, American Express, Money Order, and MoneyGram.